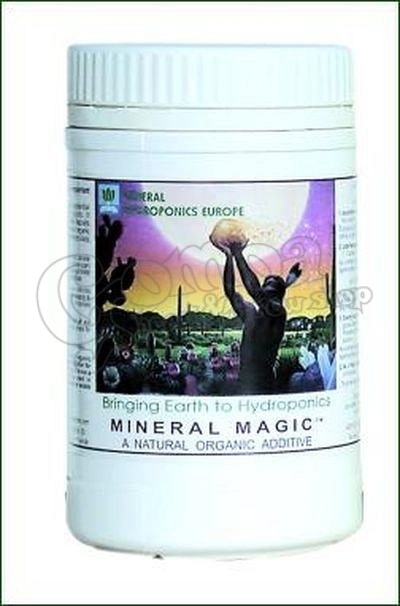 Mineral Magic is a natural silicate powder, particularly important in hydroponics and soil less cultivation as it brings in a rare element, silicate. Silicate is recognized as an essential element for higher plants.Mineral Magic contains ancient sea-bed deposits of biologically transformed organic matter, plus naturally formed silicic acid clay. Mineral Magic contains the largest range of minerals (63 ! ), and provides a naturally soluble form of Silicon which enters plant cells and builds a hardened shield against disease and insect attack. Mineral Magic’s natural colloids improve cation exchange capacity to nutrient solutions. This enhances nutrient availability. It stabilizes nutrient solution pH and conductivity which reduces stress for rapidly growing plants. It protects against toxicity of metals. In hydroponics, avoid using Mineral Magic with the micro-organisms (BM & SubCulture). It is counterproductive since in water, silicate dissolves into silicic acid, which slows the development of beneficial colonies. Conversely in soil, when mixed in powder form, the large range of elements included in Mineral Magic stimulates the growth of beneficial micro-organisms, and helps create a natural environment for extremely healthy plants.